Associated Press Target's Cat & Jack collection are clothes are made with Repreve polyester fabric, created from recycled plastic bottles. NEW YORK – For the back-to-school season, many parents and their kids are thinking green. Concerns about the environment have them looking for secondhand clothing or fashions made from reused material – but price still rules. Retailers such as H&M, Target and J.C. Penney are coming out with more clothes that use waste from all sorts of sources, like recycled denim or leather, nylon waste, remnants of old garments, or even plastic bottles. J.C. Penney is delivering three styles of jeans this fall made from 20 percent polyester created from bottles under its Arizona brand, after seeing what it believes to be teen customers searching for “recycled jeans” on its site, the company said. 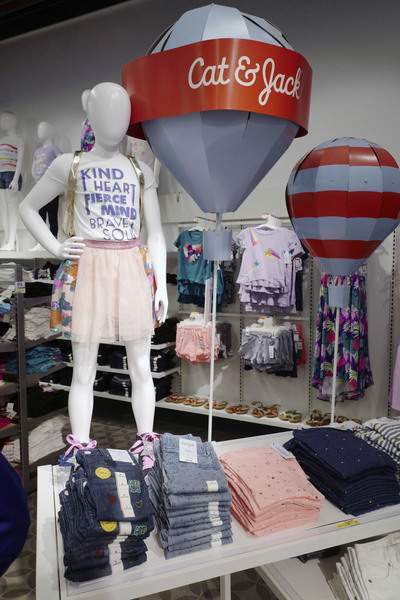 Target started offering fashions made of polyester created from recycled plastic bottles with last year's launch of its children's brand Cat & Jack after focus groups of parents and children expressed interest in eco-friendly products. James Reinhart, CEO and founder of the online used clothing marketplace Thredup, says he's finding that many of the site's shoppers aren't motivated just by price the way they used to be, but also because of environmental concerns. Abramson, of Sandwich, Massachusetts, buys eco-friendly cleaning products and recycles plastic bottles. Her daughter Emma says she likes to help the environment by recycling, not littering, and bringing a thermos to school. She says she would be interested in recycled clothing. “If it looks the same, and it is better for the environment, I would want to buy it,” said Emma, who likes to shop at Macy's, Justice and Old Navy. Many retailers are recycling. At Nike, 71 percent of its footwear and clothing contains recycled materials, and it says more than 31 million pairs of used shoes and 36,000 tons of rubber and foam have been reborn into high-performance products since 2010. H&M, which is offering jeans this fall made from recycled fabric, says more than 26 percent of its clothing comes from sustainable sources like organic cotton or recycled materials like leather and denim. By 2030, the goal is for all its products to be eco-friendly, the company said. Deborah Weinswig, managing director at research firm Fung Global Retail & Technology, says she expects to see more major names introduce more sustainable products. However, she says the trend must be kept in context. But people's style and quality expectations put pressure on retailers to keep prices the same, even though manufacturing through the recycling process can be more expensive. C. Britt Beemer, chairman of America's Research Group, says 38 percent of 1,000 millennial shoppers polled in April said they would “respond positively” to environmentally friendly products. But they would spend, on average, just 3 percent more. Another survey by Deloitte Services found that parents of school-aged children would spend no more than 4 percent extra on “green” products for the back-to-school shopping season. J.C. Penney says the recycled Arizona jeans cost from $36 to $42, comparable to other jeans in that collection. In cases when companies use remnants of old garments, keeping prices down is easier. “Using old garments and textile leftovers, when making new clothes, means we can both save on raw materials and stop old clothes from going to waste,” said Pernilla Wohlfahrt, head of design and creative director at H&M. H&M's jeans of recycled fabrics are priced from $29.99 to $49.99, the same range as its regular jeans. But recycling plastic bottles into fiber is more costly. Unifi Inc.'s Repreve business, which works with 250 companies including Target, Roxy and Fossil, says the recycled fiber sells at a 25 percent to 30 percent premium to non-recycled fiber. A pair of men's dress pants or jeans can use up to six plastic bottles, says Jay Hertwig, vice president of global brand sales, marketing and product development. The added cost comes from the collection, cleaning and converting to flakes and then to recycled polymer chips, Hertwig says. Marketing the green products can be tricky. Target uses tags that say “Responsible Style” and “Better for All.” It also provides information including how much of the fabric content incorporates Repreve, which varies from 20 percent to 90 percent. During the back-to-school season, store signs will better highlight the Cat & Jack products that use Repreve. Cat & Jack pieces that include Repreve are sold at the same price as the rest of the collection.